We all heard about the launch of Google TV, and how it hasn't been very successful. It's not really that simple to use, it doesn't work that well, and, not surprisingly, several TV stations have decided to block people from using it. The biggest reason why Google TV doesn't work, is because the whole thing is one gigantic workaround. We don't want to watch TV shows via a website, even if it is on a TV screen. We don't want to fiddle with wires to create infrared bridges just to hook it up to our DVRs. It doesn't matter how good Google are at creating software, because it the old case of "garbage in, garbage out." Streaming TV won't work until we start to solve the real problem. The problem being that we now live in a connected world. It's not about channels, distribution, websites, or anything like that. In the old and non-connected world, the only way to efficiently distribute your products was to partner with local distribution channels around the world. So the TV industry started to license their content to cable providers, who in turn distributed it to their local markets. It made a lot of sense 20 years ago. In a connected world, however, this business is wasteful and inefficient. It creates boundaries, restrictions, and limits your audience to a specific market. More than that, it also creates a gap between your audience and your product. The connected world doesn't need intermediaries to connect with your audience. You are already in direct contact, all you have to do is to meet people's needs. This is where we really start to see just how out-of-touch the TV executives really are. Their relentless focus on the non-connected business models results in a ton of mistakes. The worst part is that they don't seem to learn. They continue to make the same mistake over and over again. A good example is how they are now blocking Google TV, Boxee, and Plex. Google TV isn't a cable company. They are not distributing their content. Google doesn't sell shows or stream them via their servers. Google is not even part of the transaction. It's just software. When TV executives say that Google should license their content, they completely miss the point. Google cannot license the content, because Google isn't distributing it. All they do is to create a direct connection between the audience and the TV channels. 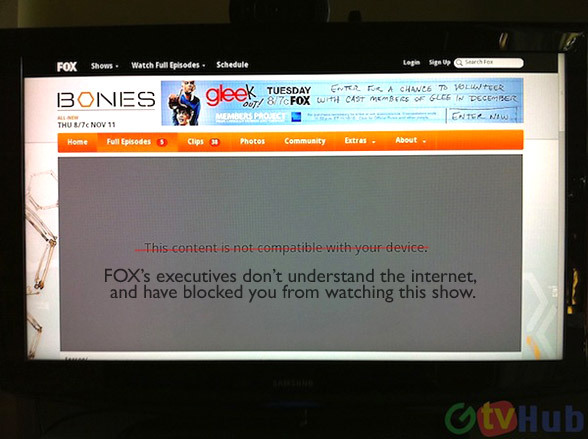 TV providers are not blocking Google TV, they are blocking their own audience. Of all the bad decision a company can make, this got to be in the top three. How can you justify renting your first-run TV shows individually for 99 cents an episode." ... "[it would] jeopardize the sale of the same shows as a series to branded networks that pay hundreds of millions of dollars and make those shows available to loyal viewers for free. Well, Jeff. Let me ask you this: Why are you giving away your brand to the cable providers? Isn't it more important to build a brand around your own network? Why should we care about Comcast? Why don't you build a brand directly with your audience? More important, 99 cents per view is a huge amount of money - far more than what the TV industry are making today. Below is the TV ratings for broadcast and cable TV in the week ending in November 7, 2010 (in the US). The total amount of views for just one week, in the US, for only the top 50 shows equals 465 million views. If everyone were paying 99 cents per view, the revenue of that would be $460 million dollars. Even if we were to put on Apple TV, and give Apple a 30% cut, the TV providers would still make $320 millions dollars. 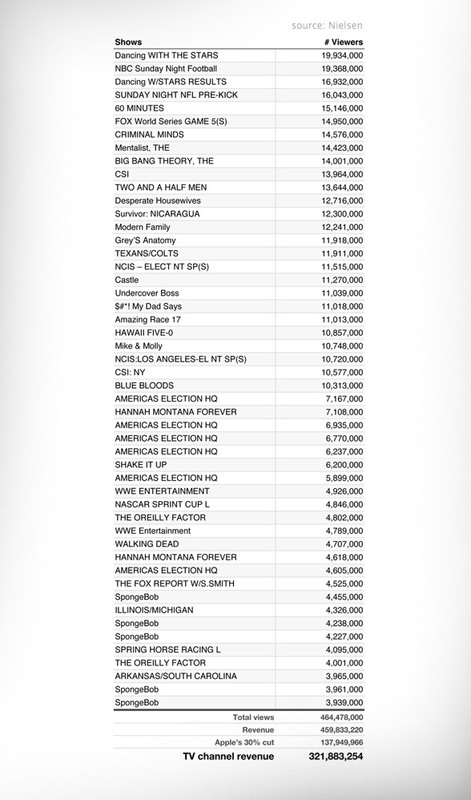 That's $320 million, for just one week, for just the top 50 shows, in the US. Now scale that up to every show, for a whole year, for the entire world, and I think you will find that "hundreds of millions of dollars" would instead be billions of dollars. The average US consumer watches more than four hours of TV per day. With each show being about 50 min. long. The total revenue, at 99 cents per show, would amount to $532 billion for the US alone. The total TV industry revenue in 2009 was about $17 billion, and Time Warner's TV licensing revenue was $1.45 billion (globally) in 2009. I find it very hard to understand why the TV industry thinks that 99 cents per show is bad for business. Yes, changing to a direct model would have a negative impact on the old distribution models. It's very likely that several cable TV providers would simply go out of business. But the overall profit would increase substantially. People are obviously not going to pay 99 cents per show, that's far too expensive. But if you cut the intermediaries, and give people what they want, how they want it, and where they want it, you will not lose. It's a connected world, plug in!